Over the past two decades, a lot has changed. The technology has advanced so far, that it has opened up completely new horizons. In terms of business, this means more opportunities and more ways to reach consumers. Online marketing is now a part of our reality, always included in the business plan, as a medium of improving business and realizing goals. Its potential has been proven so many times, that it is slowly taking over, leaving traditional marketing techniques far behind. It is estimated that almost 40% of the world’s population use the internet, and with this in mind, it is natural to think of the internet as a great place for advertising your business. The main distinction between these types is the medium used to reach customers. Additionally, each type requires a set of strategies to be successfully implemented in a business plan. Best practices and guidelines are also something to have in mind when planning a strategy. 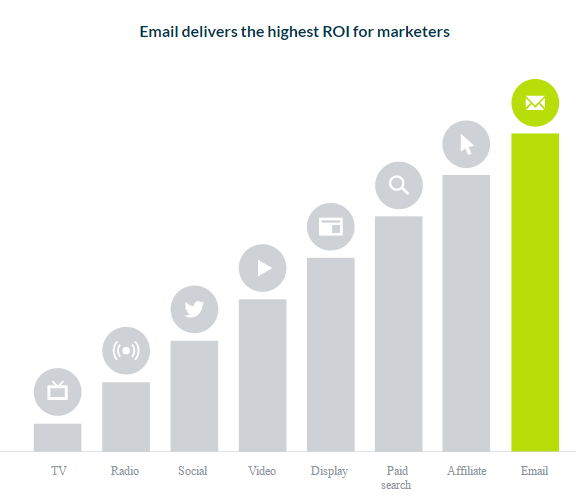 Out of all the types of online marketing, email marketing delivers the highest ROI for marketers, which is why it is so widely used. You should consider email marketing as a modern way of communicating with consumers. Emails, as a form of communication, have been around for decades, ever since the first sent email message back in 1971. Over the years, the World Wide Web has evolved and grown, and email marketing has found its rightful place in the business world. Although email messages were once a popular way of communicating with friends, online messaging apps such as WhatsApp, Viber, etc. have taken over this role. Despite this fact, emails are still important and a large percent of people do check their email inbox daily. This gives a high potential to reach online consumers. Email marketing should be a personalized approach, where your goal is to directly communicate with the online users in order to achieve something, such as generate a sale, get visitors, encourage downloads, etc. Even though an email marketing campaign is, in essence, a promotional campaign, you should go beyond this concept and use a more subtle approach to both reach and engage online users. The goal of email marketing is to get the message to the consumer, but it is not enough to simply send a message. You need to encourage open rates and you need to explore how the consumers are interacting with your email, whether they forward it, click on the links, etc. In this ebook, you will learn the basics of email marketing, optimization of an email campaign, how to grow your mailing list and implement email marketing in your business, all for the purpose of improving your business through this online marketing technique. Tools and analytics are two additional aspects you will need to implement into email marketing strategy to complete the approach. Having this in mind, you can now understand how email marketing can help your online business, how it can help you take your business to the next level.